At the heart of the Garden Coast, lovely Folkestone has much to offer, with towering white cliffs to the East and broad sandy beaches to the West. It's lovely harbour and wonderful sandy beaches make this a popular seaside resort, becoming one of the Cinque Ports in the 13th century. Enjoy four nights dinner, bed and breakfast along with wonderful excursions to Ostend and Leeds Castle. Set in tranquil surroundings and overlooking the English Channel, the family-friendly Best western Plus Burlington Hotel was built in the 1890s and still holds it's Victorian charm, whilst offering all the mod cons you'd expect of a contemporary hotel. Just a 10 minute walk from Folkestones town centre. All 60 recently refurbished bedrooms are bright and airy whilst the restaurant is bright and modern in style. There are two bars where guests can enjoy a drink and relax. Please Note: A Full Current British Passport is required for this tour. A full day excursion to Ostend. We board the Eurotunnel and head for Calais then journey to Ostend. This enchanting Belgian resort has a wide sandy beach, fishing harbour and a bustling shopping area. (Passport required). 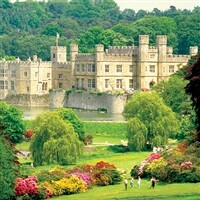 A full day excursion to Leeds Castle & Gardens (Admission included) The 900 year old moated Leeds Castle is set within 500 acres of beautiful grounds, in the heart of the garden of England. The ethereal Castle Island garden has an ancient feel with traditional flowers such as marigolds, roses and lavenders in creams and white. In contrast the Barbican rockery boasts flora and fauna from around the world with Turkish bulbs and Australian ferns.